A 59-year-old Odin man has been arrested by Odin Police for domestic battery and intimidation. Ray Adams of Wood Street was taken to the Marion County Jail. A 27-year-old Centralia man was arrested by Marion County Sheriff’s Deputies on an outstanding felony warrant for felony possession of a weapon. 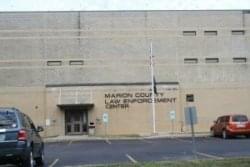 Curtis Moghadam of North Walnut is being held in the Marion County Jail in lieu of $50,000 bond. Two people were arrested Tuesday by Marion County Sheriff’s Deputies for bond violations 38-year-old Shannon Lambert of Bryant Lane in Salem remains in custody. 40-year-old Dennis Schuchman of Chicago Avenue in Wamac posted $1,500 bond and was released. 26-year-old Blossom Plumb of South Washington in Salem was arrested at the courthouse for a probation violation. 27-year-old Tosha Linden of Airport Road in Salem turned herself in on a Marion County traffic warrant. She was released after posting $250 bond. 25-year-old Cody Reynolds of South Marion in Central City was arrested by State Police for driving on a suspended license. She was released after posting $150 bond.